Now that the holidays are over life is supposed to slow down, right? I don’t find that happening at all. Now along with the regular routine, I need to take down and put away all the holiday decor, find homes for the new toys, and dust. Definitely a lot of dusting. I got motivated right before Thanksgiving to dust and clean all the places before putting up the Christmas decorations. But, now its weeks later, and there is no evidence of that November deep clean anywhere. Dust re-accumulated, tiny bits of wrapping paper settled under furniture, and broken ornament pieces hide in the rug (thank you toddler tree un-trimmer).In the midst of the busy, meals often slip up. I’m tempted to grab something easy and less than nutritious so I can get back to work. I’m so glad I found Progresso Light Soups for a delicious easy meal. With 10 light soups (all 100 calories or less per serving) I can serve a variety of delicious meals without slowing down! After all the heavy meals of the holidays, a light soup hits the spot! Our amazingly warm holiday weather has gone, leaving behind many cold dreary winter days. This week Progresso’s Light Creamy Potato Bacon Cheese was the perfect warm up after spending the morning on outside chores. Want to stock up on these delicious low-calorie soups? 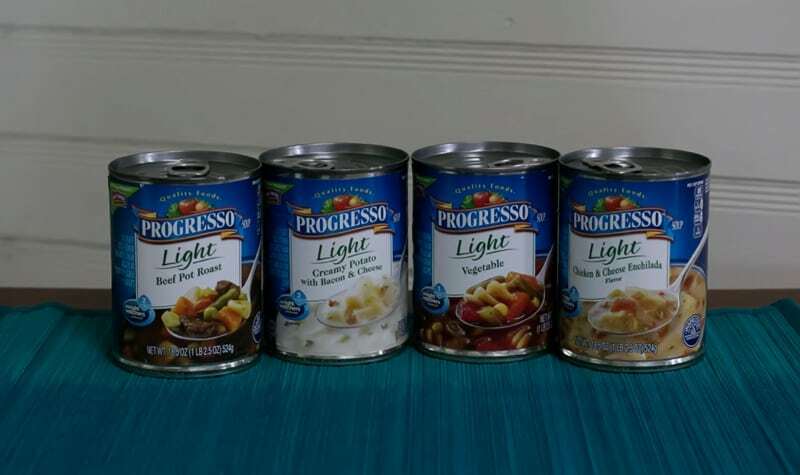 Use this coupon to grab $1 off any 4 cans of all varieties of Progresso Light soup at Kroger. One lucky winner will receive $20 Paypal Cash! Enter by visiting this page, then comment on this blog post with Progresso’s slogan and how Progresso Light can help with your New Year’s health resolutions. Winner will be chosen from comments below. Contest begins now and ends January 24th, 2016 at 11:59pm. "Progress is delicious!" Progresso can help me with my new year's health resolutions by filling me up with nutritious, lower calorie yumminess so that I don't overeat stuff that ISN"T nutritious! "Progress is Delicious". Looking to have a less hectic 2016. Progresso would definitely help with an easy way to have dinner quick. Progress Is Delicious It helps me with my New Years Resolution of eating healthier. Progress is delicious and with the soups only containing 100 calories or less per serving it will help with my calorie count intake and also make me full because their soups are delicious and filling. I actually have a pantry filled with Progresso soups! (: My husband loves their soups so much. I am trying to eat healthier and lose weight and stay fit! This will definitely help me do that. I love their slogan that Progress is delicious! They have so many tasty varieties with o oh 100 calories or less, so they will keep me full, satisfied, and on track! Progress is delicious! A light soup and salad makes a nourishing meal that gives you energy and protein. Thanks for sharing the coupon! Progress Is Delicious when using Progresso soups in the New Year. They offer a healthy alternative for lunches and dinners. They are satisfying and full and can be sued in dishes to help make you even more full. We are looking forward to using Progresso to make our New Year delicious! "Progress is Delicious" is the slogan and these soups can help me stay within my calorie range while staying full. "Progress is Delicious." Light Progresso soups will help me eat healthier this year because they are low calorie. Progress Is Delicious! I would say that Progresso is a great way to eat more healthy in the New Year, which would help me with my goal for the year. The slogan is Progresso is Delicious. And Progresso can help me with portion control so I can lose weight. Progresso's slogan is "Progress is Delicious". 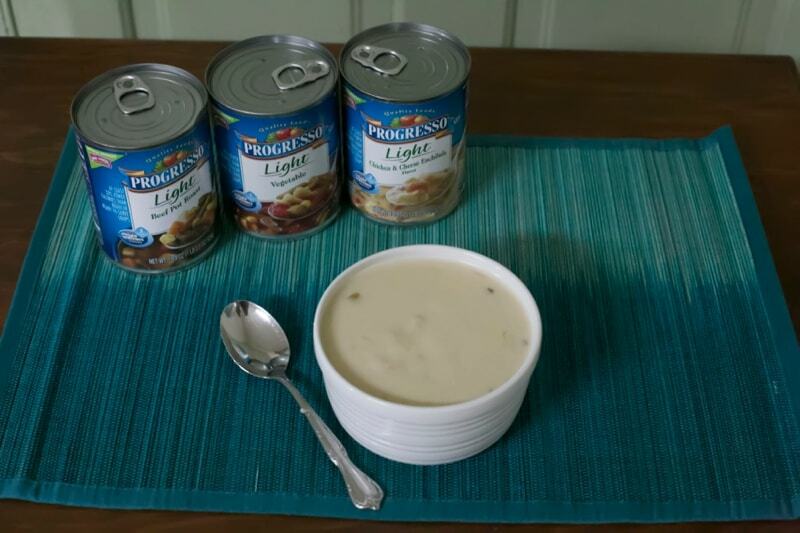 Progresso Light can help me reach my New Year’s resolutions with at least 33% fewer calories than regular ready-to-serve soups. Progress is Delicious. This would help me eat a healthier lunch instead of being tempted by the vending machine at work! Progress Is Delicious is the slogan and this would be great as these are healthy and would fit right in with my diet. The slogan is Progresso is Delicious. Progresso can help with my resolutions by helping me save money and eat better this year. 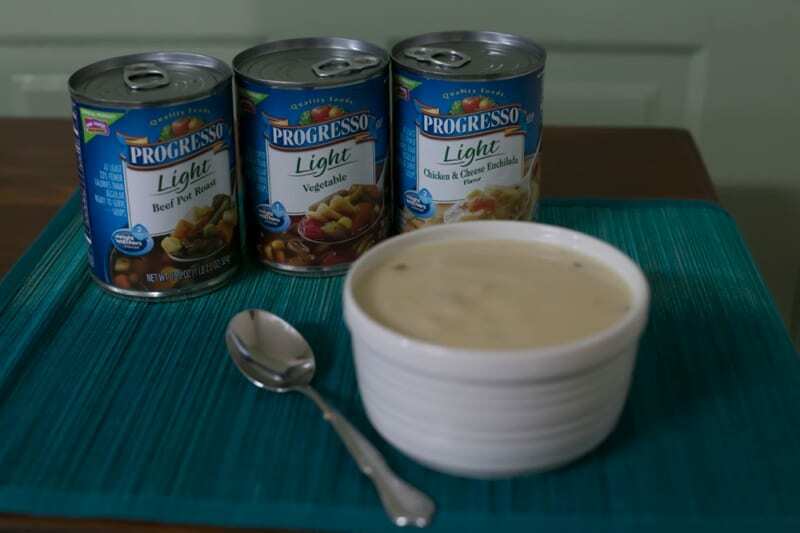 Progresso light soups can help me lose weight by filling me up without all the calories. Progress is delicious is their slogan. The light chicken noodle soup. My goal is to start walking again on my lunch break at work. The soup will help me because it is a quick meal to heat up before going on my walk. The slogan seems to be "Progresso is Delicious". Soup is a tasty and filling, yet low cal meal for staying healthy year round! Progress Is Delicious! The lighter versions would be a great help for weight maintenance by being good nutrition with fewer calories. One of my resolutions is to lose the 15 lbs left over from my second pregnancy, Progresso can help if I subsitute my normal lunch for Progresso Vegetable soup (one of my favorites). Make it Progresso. or make it yourself. Slogan is "Progress is Delicious"..progresso helps with eating more vegetables and getting away from fast food. Progress Is Delicious The low calorie options can help me lose weight <3 Thank you! I'm making a stronger effort to cook at home instead of getting drive-thru. Progresso Light would sure make this easier. Progresso is Delicious. And it can help me my New Year health resolutions by giving me 10 delicious flavors of 100 calories or less soups to eat on my diet.
" Progress Is Delicious" I love Progresso soup. They tastes great and are good for you. Sometimes I'm a busy mom and its super helpful to get a chicken soup on and feed my family. With the new light Progresso soups that has 100 calories or less I'm able to stay healthy and still do everything that needs to be done. Progresso's slogan is: Progress Is Delicious These soups will help me keep my resolution of eating healthier lunches at work, instead of going out for fast food all week! Their slogan is Progress Is Delicious! - Help meet your New Year’s goals when you stock up on over 10 Light Soups, 100 calories or less per serving! Save on your favorite homemade flavors. My New Years resolution this year is to learn to cook healthier for my family. I have so much to learn, but Progresso Light soup would really help me in that journey! Love that they are all 100 calories or less! Ready Plan Save. I need to cut down on salt. Progress is Delicious. You can help me reduce salt. It will allow me to eat healthier and their slogan is "In the New Year 2016, Eat to Lose – #ProgresswithProgresso"
Their slogan is Progress is Delicious. These can help with my New Year Resolutions because I can eat healthy and not sacrifice taste. I like that they have 10 different kinds to choose from. Progress in Delicious is their slogan and their light soups could fill me up with few calories so I can lose weight. "Make it Progresso or Make it Yourself" Soup is easy to fix and that helps save me time and make it easy to stick to a lower calorie diet. Also its less calories if I choose the Progresso light! Progresso is delicious! Im trying to be healthier this year. Is it okay to enter if I have a valid paypal? Progresso is delicious. Progresso can help me eat healthy for the new year. Progress is delicious! This is so true esp with Progresso Lite soups. I frequently take them to work with me because they are satisfying. The slogan says Progress is Delicious. I'd like to try the clam chowder- would be tasty AND healthy on this snowy day. Progress is delicious! 100 calorie servings can help a healthy eating plan. Quality Foods- It would help me lose weight. The only slogan that I can see is 'quality foods'. I started working out this year and I love soups, so their light soups would be perfect for lunch or dinner for me! "Make It Progresso or Make It Yourself.” Progresso can help me to eat healthy when I am in a time crunch.